Opera has released a new version of its mobile browser – and it comes with something special. Opera for Android 51 includes a built-in, unlimited VPN to protect your privacy and improve security – and it's free. The built-in VPN should prove particularly handy if you're connecting to public Wi-Fi hotspots in places like cafes and hotels. It uses 256-bit encryption to secure your data, and re-routes it via remote servers to disguise your physical location from trackers. The servers won't log any of your activity, either. You don't need to download any extra apps for extensions to use the VPN, and there's no registration – just toggle it on in the browser's settings. 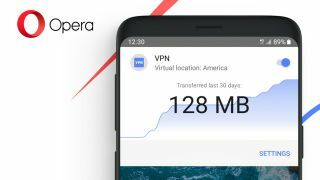 “The fact is that users are exposed when they connect to public Wi-Fi without a VPN,'' said Peter Wallman, senior vice president of Opera Browser for Android.